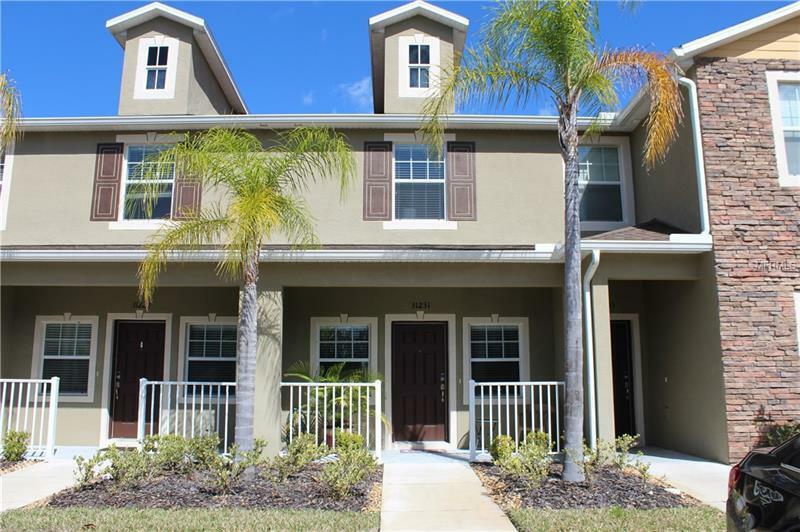 2 BEDROOM 2 ½ Bath, MAINTENANCE FREE TOWN HOME!!! 1178 Sq. Ft., Two Story home with Eat-In Kitchen that Features 42 Inch Wood Cabinetry Topped with Sleek Granite Counter Tops, Stainless Sink & Faucet and FULL Stainless Steel Appliance Package. The Master Suite is located on the Second Floor and has 2 closets & Master Bath with shower. Two Full Baths upstairs and convenient 1/2 bath downstairs for guest. The Energy Saving, Low E Windows will save you money every month and the water is already included in the monthly maintenance fee and so is trash pick-up. The outside grounds are all taken care of too! Covered Screen Lanai has an exterior storage closet. Extras Include: R-30 Insulation, Complete Blinds Package, Raised Panel Interior Doors, Gutters over Front Entry. The Community Pool & Clubhouse are also ready for you to enjoy. Great Location with Easy Access to I-75, I-275 and great Shopping & Restaurant Options available at Wiregrass & Tampa Premium Outlets. This property is Super Clean! Pride of Ownership shines through.